Robotically-assisted heart surgery is the latest advance in trying to move open heart surgical procedures to the category of minimally invasive surgery - that is, to minimize the extent and the trauma of cardiac surgery as much as possible. Most minimally invasive surgery is performed by passing an endoscope (a small tube containing an advanced optical system) through a tiny incision. Surgical instruments are then passed either through the endoscope tube itself, or through an additional tiny incision. While visualizing the surgical area through the endoscope, the surgeon manipulates the surgical instruments to complete the operation. Such endoscopic surgery works well for several types of operations (such as gallbladder removal and knee repairs,) where the part of the body to be operated upon is motionless, and the surgical maneuvers that need to be performed are relatively simple. But moving the surgical instruments manually during endoscopic surgery can be difficult - the length of the instruments is far longer than normal, and the "feel" of these long instruments is non-intuitive to the surgeon. Long instruments also exaggerate normal hand tremors. Thus, endoscopic surgery has achieved only limited success in more complicated operations such as heart surgery, where the heart is beating and the necessary surgical maneuvers tend to be complex. Robotically-assisted endoscopic heart surgery is aimed at making endoscopic heart operations feasible. With this technology, the surgeon manipulates the surgical instruments with the help of a computer. An endoscope is passed through a tiny incision in the chest wall, and two surgical instruments are passed through additional tiny incisions. The surgeon views the image provided by the endoscope on a computer screen. Instead of manipulating the surgical instruments directly, the surgeon manipulates them via a computer console - similar to manipulating a gamepad to play Ninetendo. The computer interprets the surgeon's hand movements and causes the surgical instruments to respond accordingly. This system addresses the major disadvantages to moving the long surgical instruments manually - computer control of the surgical instruments essentially eliminates the tremor effect, and also the non-intuitive feel of maneuvering such instruments. While it takes special training to become adept at using robotically-assisted instruments, most surgeons who have had such training report that they feel quite comfortable maneuvering surgical instruments via a console instead of directly. How is robotic heart surgery being used? Much of the early work with robotically-assisted heart surgery has been with bypass surgery. So far, this technique has been limited to single bypass grafts in the left anterior descending coronary artery (the LAD). The LAD is located on the front of the heart, and therefore is relatively accessible. It is predicted that with advances in technology, multiple grafts with robotic assistance will be possible, at virtually any location on the heart. Early efforts have been made at extending robotically assisted surgery to other kinds of heart surgery. Robotic procedures have been successfully performed, for instance, in mitral valve repair, in repairing atrial septal defects (ASD,) and in repairing patent ductus arteriosus (PDA.) It is expected that as experience and technology advance, robotic procedures will be applied to most other forms of heart surgery. Two robotic surgical systems are currently available, both developed and manufactured in the U.S. However, while both robotic systems have been approved for use in Europe, both remain experimental in the United States. It is not likely they will be approved in the U.S. until randomized clinical trials are completed that convincingly demonstrate their safety and efficacy. What are the advantages of robotic heart surgery? The chief advantage of such surgery is that the incisions that are made are tiny, and therefore recovery from surgery is extremely quick. Rapid recovery from cardiac surgery is not only better for the patient, but it is less expensive for society. What are the disadvantages of robotic heart surgery? The chief disadvantage at this point is that the technology is new, and (despite early encouraging reports) is still evolving. Its efficacy and safety have not yet been proven sufficiently to allow the FDA to approve it for widespread use. Another disadvantage is the expense of the robotic systems. They cost between $750,000 and $1,000,000, and it is unlikely that most hospitals will be able to afford purchasing the robotic systems for operations they are performing "just fine" today without the robotic equipment. The bottom line: it is likely to be several years before robotic heart surgery is widely available. What controversies surround robotic heart surgery? There are at least two that come to mind. Not all surgeons think robotic surgery is a great idea. While most agree that robotic surgery is feasible, many question whether it should be pursued at all. They cite the expense of the equipment, and the success they are currently having with today's methods of doing surgery. Such arguments against new technology date back at least to Gutenberg, of course, and are easy to counter. One suspects that those surgeons betraying a Luddite opinion might have other fears in mind - such as a complete disruption of the practice of surgery. It is easy to ask why, for instance, if a surgeon can perform a heart operation while sitting at a console 15 feet away from the patient, then why couldn't that surgeon perform the same operation while sitting 1500 miles away from the patient? In other words, competition for patients would occur on a global scale instead of a local scale. (And everyone could be operated upon by only the very best surgeons.) If such a notion does not disrupt the practice of surgery, DrRich doesn't know what does. Insurers and the government (the two entities that pay for most of health care) understand something that most of the public does not, to wit: the introduction of any successful minimally invasive procedure - while it may reduce the expense of caring for an individual - always increases the total expenditures within the health care system. This is because when a minimally invasive procedure is available, suddenly the number of patients who "need" to have that procedure expands exponentially. A good example is endoscopic gallbladder surgery. In the past, it was extremely difficult to recover from gallbladder surgery. Such surgery required extensive hospital stays, and resulted in significant and protracted misery on the part of the patient. But with minimally invasive gallbladder surgery recovery is rapid and suffering is minimized. Most people go home the same day or the next day (and as a result the expense of the procedure for each individual is far less than it used to be.) But precisely because the surgery is now so benign, far more people (people who, in the old days, would reasonably conclude that suffering in relative silence was the wisest course of action) are choosing surgery. The total cost to the health care system has exploded. The same, of course, can be predicted to happen when robotic heart surgery becomes widely available. As a result, there will be a tension between innovative companies and surgeons on one hand, and insurers, regulators, and Luddite surgeons on the other. Robotic heart surgery will not be accepted with open arms by everybody, even if its efficacy and safety are proven beyond a shadow of a doubt. What surgeries can be performed using the robotically assisted heart surgery technique? 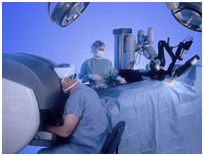 Robotic surgery is used to assist the surgeon during coronary artery bypass surgery. 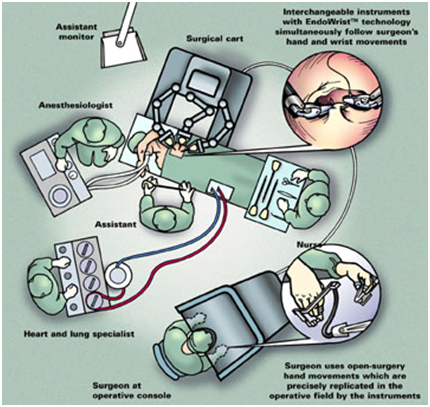 Traditionally, bypass surgery involves placing the patient on the heart-lung bypass machine (to circulate oxygenated blood during surgery); creating a 6 to 8 inch incision to visualize the heart; stopping the heart in order to stabilize the blood vessels; and performing the bypass procedure. Minimally invasive bypass surgery decreases the size of the incision to about 3-4 inches. Depending on the technique, the surgeon may choose to perform surgery on a "beating heart" or off the heart-lung bypass machine ("off-pump"). Robot-assisted surgery is used in combination with traditional minimally invasive surgery to perform the bypass surgery through a much smaller incision. The robotic arms are used to open the pericardium (sac that surrounds the heart) and to harvest the mammary artery (in the chest wall) through a very small incision. Then, the surgeon uses the mammary artery to bypass a blocked heart artery through a minimally invasive incision. In most cases, the sternum or breastbone does not need to be opened. Robot-assisted surgery has other uses. Biventricular pacing When a patient has heart failure, often times the right and left ventricles do not pump together (dysynchrony). When the heart's contractions become out of sync, the walls of left ventricle (LV) do not contract at the same time. The heart has less time to fill with blood and is not able to pump enough blood out to the body. This eventually leads to an increase in heart failure symptoms. Treatment of paroxysmal atrial fibrillation (an intermittent irregular heart rhythm that occurs in the upper chambers of the heart. 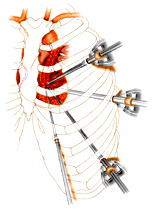 Robot assisted surgery can be used to open the pericardium and place the catheter for ablation (application of energy to correct the abnormal rhythm). What are the benefits of robotically assisted heart surgery? Minimally invasive surgical techniques are now widely used to provide patients with less pain and faster recovery time. Limitations in surgical equipment have prohibited their use during heart bypass surgery -- until now. The advancement of computerized robotic technology is one of the most exciting breakthroughs in surgery to date, enabling surgeons to perform complete, bypass surgery less invasively. Penn Cardiac Care at the Hospital of the University of Pennsylvania is proud to be the only hospital in Philadelphia and one of only 12 in the nation invited to participate in a study to determine the effectiveness of this revolutionary procedure. Penn is one of the few hospitals in the country to have a surgeon on staff specially-trained to use the robotic system for bypass surgery. A wide range of surgical options, from traditional, open-heart surgery to less invasive robotic surgery is available at Penn. Each bypass procedure is customized to meet the patient's individual needs and condition. The traditional approach to cardiac surgery requires surgeons to create an incision in the patient's chest. The robot is equipped with two small instrument arms and a tiny camera, which enables surgeons to operate through tiny incisions. By virtually transporting the surgeon's eyes and hands into the patient's body, the robotic system allows the surgeon to perform complex heart surgery without ever having to open the patient's chest.. In the operating room, one surgeon controls the robotic system, while a second surgeon works alongside the patient, making the tiny chest incisions for the robotic arms and camera. With the high-resolution, three-dimensional camera system, the operating surgeon has a full view of the patient's heart and can perform the bypass operation with the multi-jointed, robotic arms. This minimally invasive approach results in less trauma, blood loss, pain, scarring, and lower risk of infection, while improving recovery time. In addition to bypass procedures, the robotic system is being used for heart valve operations and will soon be able to assist with aortic procedures and the treatment of heart failure and rhythm management. Penn Cardiac Care is committed to providing the most comprehensive, technologically-advanced cardiac care in the region and will continue to pursue of similar developments that hold great promise for patients. Following surgery, all patients are closely monitored in the intensive care unit. Generally you will be awake shortly after surgery and can expect to sit up in bed the night of surgery, sipping fluids. Like most patients, you can move out of bed to a chair or take short walks the next day. Medication will be prescribed, adjusted or discontinued depending on your condition. Patients receive physical rehabilitation while in the hospital and are usually ready to go home a few days after surgery. Although the speed of recovery varies, patients can expect to resume their lifestyle within weeks of their operation.